Recent environmental regulations have presented a difficult challenge to petroleum coke (petcoke) storage operations and transfer stations by establishing tight restrictions on dust emissions and in some areas mandating that storage piles be housed in full enclosures, writes Mike Lewis, Dust Management Specialist at Dust Control Technology. A byproduct of the oil refining process used for various applications from cement additive to affordable carbon fuel source, the US and other nations have deemed petcoke dust to be hazardous when inhaled. The most common way to control dust from outdoor storage piles is through the use of water, but moisture content above 8% and an increased net weight can have a severe impact on the price per tonne. Smaller companies with tight profit margins are finding that proposed regulations could significantly raise operation costs and affect prices. Regardless of the standards enacted by regulators in each municipality, measurable dust emissions are required by federal law to be controlled, causing many firms to turn to antiquated solutions that have actually exacerbated the problem. In an attempt to mitigate dust, many operations have installed high-pressure sprinkler systems that use hundreds of gallons of water per minute, resulting in high water costs, material saturation and runoff. This leaves organizations facing further regulations regarding wastewater and introduces an undesirable increase in moisture content. Moreover, operators have discovered that sprinkler systems do not control airborne dust. Irrespective of the industry’s good-faith efforts, concerned municipalities and local governments have begun to consider ordinances similar to one imposed by the city of Chicago, mandating that petcoke handlers move operations into sealed, emission-free enclosures. This has caused the shutdown of small facilities in the city, since indoor storage is only economically viable for companies financially prepared to incur the high cost. Under these circumstances, operations of all sizes have taken notice of a dust suppression technology embraced by the coal industry. Addressing similar regulations, atomized mist has been found to mitigate dust emissions both in the air and on the surface of coal storage piles, with only trace amounts of runoff. Using far less water than large sprinkler systems, airborne mist helps processing operations and transfer stations stay compliant with current standards and potentially avoid further regulations regarding their wastewater. Additionally, the technology drastically reduces the moisture content of the saleable product. According to the Energy Information Administration (EIA)1, since 1999, the amount of petcoke exported from the US has doubled to hundreds of tonnes per day, increasing the amount of dust produced from outdoor storage facilities. This prompted South Chicago residents who live near the Koch Industries KCBX facility to file a lawsuit in 2014, accusing the terminal of polluting the local air and water. Prior to the filing, in response to years of complaints from residents, KCBX spent $10 million to install 42 rotating water cannons mounted on 60ft poles. The lawsuit characterizes petcoke as a toxic pollutant, but industry representatives have pointed out that the substance doesn’t fit the EPA’s definition of a pollutant2. Consisting almost completely of carbon, the commodity is traded on the futures exchange alongside crops, minerals and dried bulk goods (such as coffee). Proponents reason that a tradable and transportable inert, non-toxic substance should not be considered a hazardous waste product or a pollutant. Without awaiting resolution of the lawsuit, the Chicago City Council passed regulations in December 2014 that require petcoke and coal storage companies within the Chicago city limits to completely enclose operations. This forced the closure of a mid-sized Chicago area petcoke storage facility owned by Beemsterboer Slag Corp. However, KCBX submitted plans to build a $120 million enclosure on its existing site, measuring 1,000ft long x 200ft wide x 100ft high (304.8m x 71m x 30.5m), that would contain the entire operation by 2017. KCBX’s agreement to these demands has caught the attention of stakeholders in the petcoke and coal industries, which are monitoring the issue closely. Concerned that this may set off a trend in other US municipalities, resulting in the closure of dozens of smaller facilities across the country, petcoke facility operators are seeking alternatives to current marginally effective dust suppression methods. One of the reasons why industrial sprinkler systems like those used by KCBX are unsuccessful at managing airborne dust is because of the ‘slipstream effect’, which prevents large droplets of water from effectively capturing small airborne dust particles. When droplets fall, they cause air molecules to move around them in a current called a slipstream. The force of this effect is relative to the size and speed of the droplet. When small airborne particles encounter a large droplet such as those from a sprinkler, they can get caught in this current, causing them to deflect away from the droplet rather than colliding with it and being absorbed. To improve the effectiveness of trapping airborne dust with water, a technology called ‘variable particle sizing’ (VPS) is used to adjust the droplet size to match the size of the dust particles. According to the US National Institutes of Environmental Health Sciences3, a cross section of the average human hair is about 100 microns in diameter, the same threshold at which the US Environmental Protection Agency (EPA) considers dust to be inhalable through the nose and mouth. Dust particles that are 200 microns or smaller are able to linger in the air and travel on naturally occurring atmospheric currents. This is also true for water droplets. These particles and droplets are no longer visible to the naked eye below 50 microns. In comparison, industrial sprinkler systems create droplets between 200 and 10,000 microns in size3, and atomized mist uses VPS to produce droplets between 50 and 200 microns. 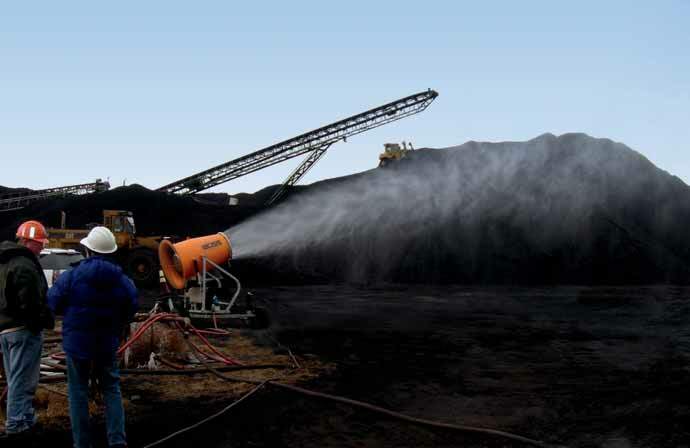 While sprinkler droplets quickly fall to the ground without encountering a high number of airborne dust particles, millions of atomized droplets are introduced into the atmosphere surrounding petcoke storage piles, travelling with the dust and colliding with the particles, absorbing them and using the collective mass to drive both to the ground. Rainfall, snow and ice runoff can be predicted through rainfall averages and accurate modern weather modelling to engineer a site’s water drainage. Industrial sprinklers, on the other hand, can erode an unreasonable amount of product, strain containment systems and consume massive amounts of water, often exceeding even the hardest downpour. By using high-powered industrial sprinklers, the cost of water can become a major expenditure and require more extensive runoff control systems, as well as increased man hours devoted to management. Even a large atomized misting machine, such as the DustBoss® – 60 (DB-60) manufactured by Dust Control Technology averages a fraction of the water usage at just 23 GPM (88 LPM), requiring a minimum inlet pressure of only 10PSI (.7 BAR). Using a 359° oscillator, a single unit can cover as much as 125,000ft2 (11,612m2) of area by throwing an engineered mist in a 200ft-long (60m) cone using a powerful 25HP industrial fan. Atomized mist settles gently on the surface of material without saturation, controlling the moisture content and weight of the product. Lower water usage means less runoff and pooling, reducing product loss and overall operating costs. Though wind is a concern when storing any bulk material outdoors, the offloading, disruption and loading of material into trucks, trains, barges and containers is the primary cause of petcoke dust. This makes identifying problem areas and employing the correct dust suppression technology very important around these operations. To address dust from surface material caused by wind, coal storage facilities have successfully employed surfactants and utilized atomized mist, both for dustcontrol and as a chemical delivery method. Surfactants are compounds that mitigate the hydrophobic qualities of substances like petcoke and coal, allowing droplets to spread more effectively and prevent dust from escaping. When equipped with a dosing pump, atomized mist can distribute water and dissolved chemicals evenly across the surface of the pile. The angle of the misting machine can be adjusted so that it provides control of both surface dust and airborne particles. To combat dust emissions caused by offloading and disruption, atomized mist units employ a specialized barrel design with an industrial fan on one end and a misting ring on the other. The machines can either be tower mounted or placed on moveable trailers for additional versatility. Units can be aimed and adjusted by remote control to address a specific location, and can be equipped with adjustable oscillation to cover a wide area. Trailer mounted units are easily relocated to provide coverage at problem areas across the entire worksite or in response to changing wind patterns. Loading onto barges, ships and containers from a conveyor can cause dust to travel longer distances. As an additional option for dust management, a ring mounted at the discharge point can create a curtain of atomized mist around the falling cargo, preventing dust from escaping and directing it back into the main material flow. Operators of petcoke storage facilities, local residents, environmental groups, and state and federal officials need to agree on a list of best-practice solutions that will keep jobs in the area with as little environmental impact as possible. Given that the current approaches to petcoke dust management have not resolved all of the issues, alternatives to extreme solutions like enclosures should be thoroughly reviewed and considered before making them universally required. Atomized misting systems have allowed coal companies to engage in environmentally responsible dust control with considerably less product loss and water usage than large-scale sprinkling systems. It could very well be the solution that makes the most economic and ecological sense for the petcoke industry, as well. 1. Chart, “Petroleum and Other Liquids: Subcategory: Petroleum Coke,” U.S. Energy Information Administration, U.S. Department of Energy.Washington, D.C., July, 31, 2015. 3 Staff, “Particles: Size Makes All The Difference”, National Institute of Environmental Health Services. Research Triangle Park, NC, 2006. Table 1”, University of Georgia, College of Agricultural and Environmental Sciences. Athens, GA, 2012.